Written and Media by Dylon Niswonger. Nineteen teams and nearly 850 athletes competed last Saturday, April 14, here on our home turf for the Greenville Select Track and Field meet. The competition was stiff and the weather was rough, which served as an unusual equation for a great day on the track for the Panthers. This meet served as a stepping stone for conference. Confidence should be high after these ladies put up some great performances at the midpoint of the season. This event is one of the largest meets Greenville competes in other than NCCAA Nationals. Each event was packed with competition, which offered a prime opportunity for each athlete to improve. On the sprint team, Taylor Tucker, a freshman, sprinted a great mid-season race in the 100-meter with a time of 13.23 seconds, ending 14th out of 51 finishers. This time also earned Tucker a race at Christian Nationals. Tucker looks forward to the competition to come as well as conference. In the 400, junior Jayda Fowler ran a remarkable race, coming in 13th among a large number of top-notch quarter-milers. These are encouraging mid season races by both athletes. Sheridan Noll competing in the 800 meter race. 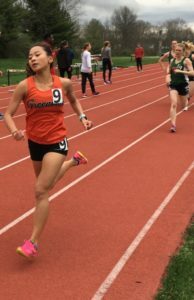 In the mid-distance category, Lia Kruse, a senior, raced in the 800 and 1500-meter races, producing sound performances in both. In the 800, Kruse broke 2:30, which was a notable milestone. Then she completed the 1500 with a time of 4:59, which pegged her second place for the day. Kruse has cranked out impressive performances in this event throughout the year. 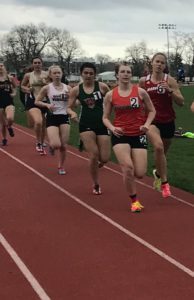 Lia Kruse running a mid-distance race. The steeplechase was the distance race to watch on Saturday. Seniors Megan McKee and Brooke Goodyear scored in this race. In sixth place was McKee, who killed it with a time of 12:31, a 21-second personal record, securing her a race at Christian Nationals, which has been her goal all four years of collegiate running. The steeplechase is one of the most intimidating races an athlete can take on. McKee had considered not racing the steeple because, she stated, “there is really no way to be fully prepared for a steeplechase.” With that said, she cleared each barrier safely and ran the fastest steeple race of her life. McKee is excited to compete at conference and Christian Nationals. Goodyear scored with a time of 12:51, finishing eighth and setting a positive pace for the remainder of the year. Throughout the year Rachel Hanna has crushed it in the pole vault. 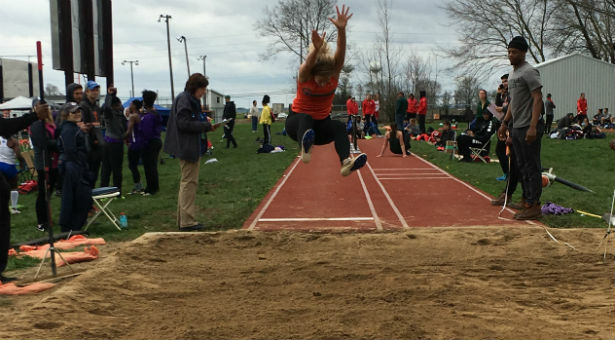 She has had some top finishes against stiff competition and even had the opportunity to medal at Indoor Christian Nationals this year. Hanna vaulted a height of 9′ 0.25,” pinning the eighth-place finish in the pole vault. With only four more track meets left for the Greenville Track Team this season, nerves are continually building. For some of our athletes, it is the last four weeks of their collegiate career. As our ladies look toward the SLIAC Conference meet and then to Christian Nationals, the desire to drop their all-time best performances is evident. This upcoming Friday, April 20, the Panthers will compete at Rose-Hulman Institute of Technology where they plan to build on their momentum for the conference invitational. Some tough meets are around the corner, and I challenge supporters to keep informed on how our athletes do.